Tuesday morning, Charles Kurt joined us as our guest speaker. Mr. Kurt shared his heroic story of growing up in a Jewish family living in Vienna, Austria just prior to the beginning of World War II in 1938. He spoke of his travels across Europe as a 13 year old boy, fleeing the Nazi invasion of Vienna. He spent time in a orphanage in Brussels before traveling to New York, and eventually Houston where he was reunited with his mother. Charles shared memories of getting on a train headed to Brussels, having to leave his father behind. This was the last time he saw his father who was eventually imprisoned in Poland in a concentration camp. Mr. Kurt is an amazing man who shared his very personal story of despair and triumph with our club. 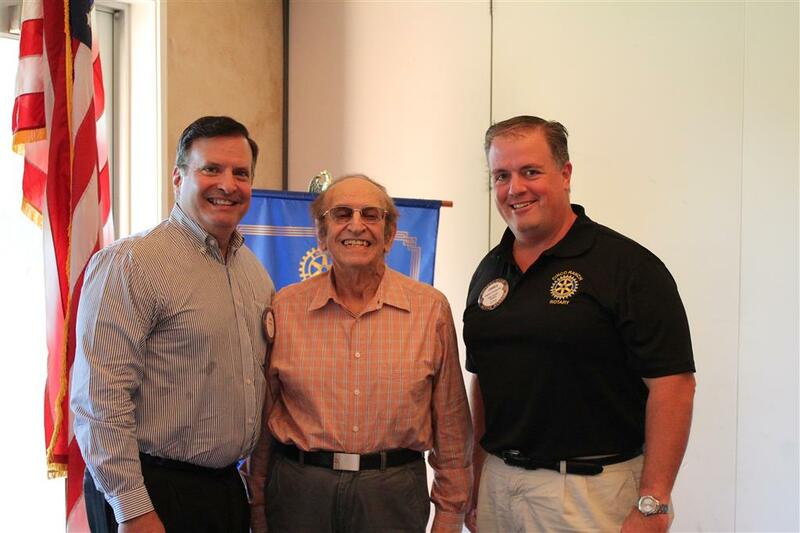 Pictured is Paul Kurt, Charles Kurt and Cinco Ranch Rotary President, James Tomberlin.